This meal has been a hit with the family and so simple. Potatoes and sauerkraut go together and add smoked sausage and you have a delicious meal. Once butter is melted in skillet over medium heat, add remaining ingredients except mashed potatoes. Cover, cook until heated through. 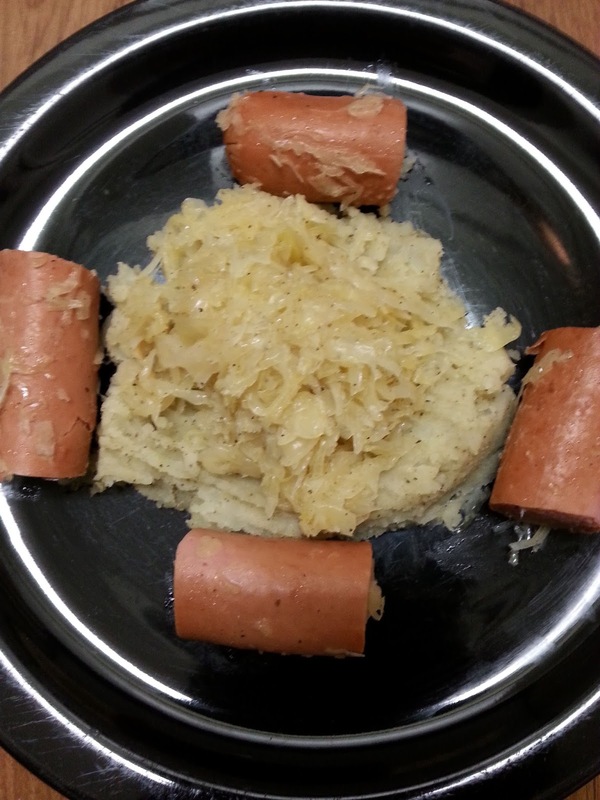 Serve sauerkraut over mashed potatoes with smoked sausage. Note: Cook mashed potatoes to your liking. This is the kind of cooking I love, short sweet, hard to beat. You cannot beat simplicity in food. I make my own naturally fermented sauerkraut in a 7.5 Liter German Harsch fermenter (about 6 weeks, 12.5 pounds of cabbage, less the outer leaves) (6 one quart cram-packed Mason jars in the refrigerator). You will never buy store-bought sauerkraut that is as good as true sauerkraut. Using cabbage it comes out a light green color, not the tasteless white color like grocery store brands. Hi Dave! Thanks for stopping by. I love your comment. Again, thank you so much!